PastaPrima.com. Have you ever grilled pasta? Pop some fresh or thawed ravioli onto the grill and become a believer. 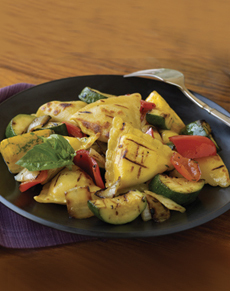 We got such good response to our recent Pasta Primavera recipe that we’re sharing another take on it—grilled ravioli with grilled vegetables. Prep time: 20 minutes. Cook time: 4 minutes. Yields: 4 servings. 1. MARINATE. Slice the vegetables into half inch pieces, large enough to fit on a skewer. Put the vegetables into a sealed plastic bag with the marinade ingredients, shake, and marinate in the refrigerator for 4-6 hours or overnight. 2. THAW. While the vegetables are marinating, thaw the ravioli and soak the skewers so they will not burn. For quick thawing of frozen ravioli, soak in tepid water for about half an hour, or defrost in the refrigerator for 6 hours. Soak skewers for several hours. 3. PREHEAT. Preheat grill to medium-high heat. Let the marinade drain off the vegetables in a colander, to prevent flare-ups. 4. GRILL. Slide vegetables onto skewers. Place ravioli on the grill. Cook vegetables apart from the ravioli on the other side of the grill. Both will take about 2 ½-3 minutes to cook. Keep the grill lid open. 5. SERVE. Top with the optional garnish(es). Find more of our favorite pasta recipes.